The end is now upon us. Within hours of the posting of this entry, Cassini will burn up in the atmosphere of Saturn ... a kiloton explosion, spread out against the sky in a meteoric display of light and fire, a dazzling flash to signal the dying essence of a lone emissary from another world. As if the myths of old had foretold the future, the great patriarch will consume his child. At that point, that golden machine, so dutiful and strong, will enter the realm of history, and the toils and triumphs of this long march will be done. For those of us appointed long ago to embark on this journey, it has been a taxing 3 decades, requiring a level of dedication that I could not have predicted, and breathless times when we sprinted for the duration of a marathon. But in return, we were blessed to spend our lives working and playing in that promised land beyond the Sun. My imaging team members and I were especially blessed to serve as the documentarians of this historic epoch and return a stirring visual record of our travels around Saturn and the glories we found there. This is our gift to the citizens of planet Earth. So, it is with both wistful, sentimental reflection and a boundless sense of pride, in a commitment met and a job well done, that I now turn to face this looming, abrupt finality. 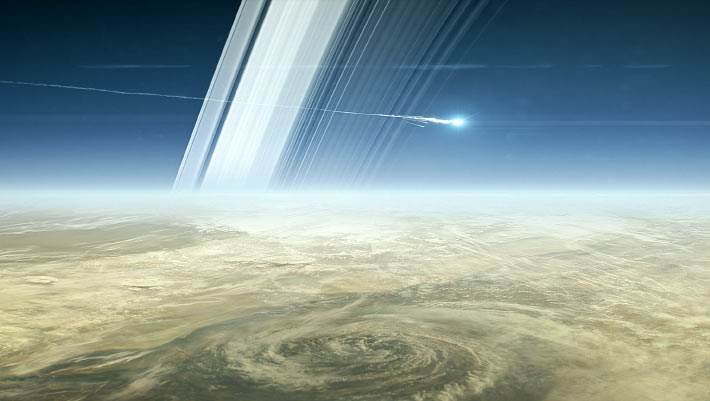 It is doubtful we will soon see a mission as richly suited as Cassini return to this ringed world and shoulder a task as colossal as we have borne over the last 27 years. To have served on this mission has been to live the rewarding life of an explorer of our time, a surveyor of distant worlds. We wrote our names across the sky. We could not have asked for more. I sign off now, grateful in knowing that Cassini’s legacy, and ours, will include our mutual roles as authors of a tale that humanity will tell for a very long time to come. Hi there, is there footage of Cassini actually plunging into the atmosphere, just before it burns up? Incredible job done with Cassini by some of the smartest, and best people there is today. I only wish I could of been there as a part of the team. i miss my friend the Cassini probe. I,ve been a very long time without posting here unfortunately, but I want to thank you very much, Carolyn, as well as the rest of the CICLOPS team for sharing with us all those images and letting us dream with worlds so fascinating, from ringed Saturn to distant Phoebe and especially Enceladus and Titan. Your last entry has been especially touching to me. The next day to Cassini's transformation in a myth, I took the telescope to watch Saturn as a homage to it. The planet was there, girdled with its rings, and of its moons just Titan was visible. Very different to what it was before Cassini's arrival but at the same time it had not changed at all, alone again. Cassini is gone and all that remains is Huygens somewhere at Adiri, in Titan, but her legacy will endure and -hopefully- will inspirate new generations to boldly go where no other has gone before, to unlock the mysteries of the Universe. Kudos to everyone who has made this adventure possible . Did Cassini revive Aristotle's dreams? A longtime friend builds custom Dobsonian telescopes and motorized equatorial platforms for clients all over the world. We observed Saturn on his personal telescope recently (32" mirror, high up in the Sierra Nevada foothills, on a clear night with exceptionally stable viewing conditions). 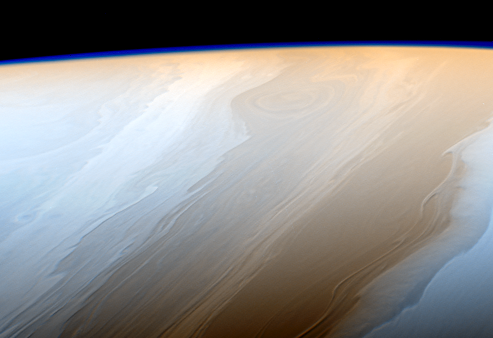 Amazing views — although nothing close to the stunning images Cassini sent to Earth. Anyway, it occurs to me that with Cassini gone (and by extension, a human presence), Saturn seems more distant; maybe even a little lonely. 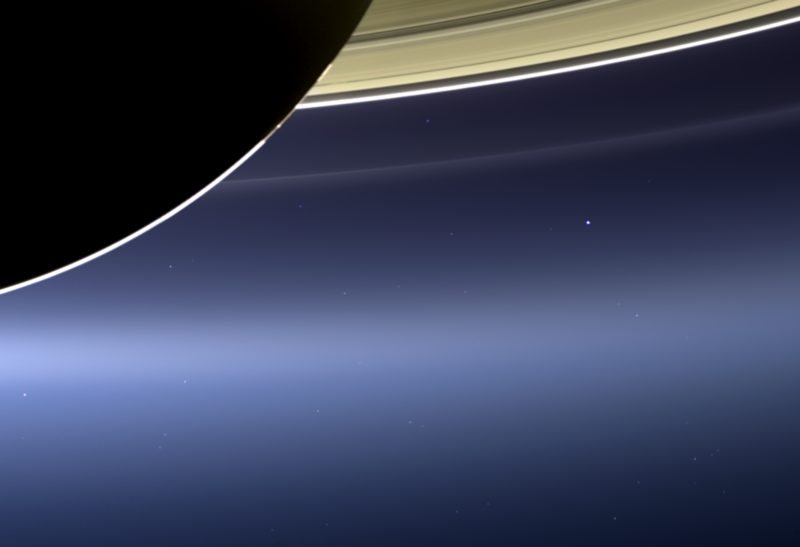 Kudos and heartfelt thanks to everyone who made the Cassini mission possible. Well done. Mission accomplished. Humankind will always remember these pioneering steps into the Universe beyond our little blue dot. In troubled times, it's good to know that our species is capable of wonder — and wonderful accomplishments. I can't thank you people enough for all of this. What an amazing gift to have the ability to sit in front of a screen and see all of this, its almost hard to comprehend. I often think of what people like Johannes Kepler or Ben Franklin would say if they were around to see what they have contributed too. Indeed, they would be awestruck. To Carolyn Porco, who has a place with those great names, and who has given herself to see that we as a species achieve our destiny among the stars, thank you. Carolyn - you have been my guide to a different world - an ambassador to what is humanly possible. I can't thank you enough for all of your diligent posts. Receiving them over the years has been the best diversion which I've allowed myself to get lost in. Personally it's hard to imagine my inbox without those precious invitations to explore the universe and -even if just temporarily - leave the rest behind. For the larger picture your important work reminds us that we are but one small place where an amazing turn of events have come to pass. We ought not take anything for-granted. Thank you so much, and let's figure out how to continue! Captain Carolyn, I cannot thank you enough for keeping us updated on the Cassini Mission the last 20 or so years! Within that time so much has been discovered in the Saturnian system by Cassini and so much has happened on our pale blue dot! Thanks to your diligence with keeping us updated on Cassini, I've been able to share your posts with my 11 year old twin boys who have marveled at the images that have been transmitted by Cassini. Also, we really enjoyed the PBS specials on the Voyager probes and especially the mini-doc, "Second Genesis". We will pay tribute to Cassini tonight by watching "Death Dive to Saturn" on NOVA. I find myself thinking back to all the controversy over Cassini's launch and the unfounded fear that somehow Cassini would explode in the atmosphere spewing radiation. Along with exploration comes danger and the unknown yet what an ROI the citizens of Earth have received over all that has been learned by the Cassini Mission. My family and friends will always support NASA and scientific research. It really is up to us to lean on our representatives to expand funding for NASA, the NSF and other agencies doing science for the good of humanity. Thank you for a very exciting time for a lot of years. Seeing what no man has even seen before was totally awesom. You did a great job. Good bye Cassini, you will be missed. Thank you very much for taking us all along for the ride Captain and providing a window seat. Time to publish all the pictures there weren't time for before...hint hint!! Kudos and great job to all! I usually am a wordy guy, but this day words fail. So if I may let me paraphrase Captain Kirk's farwell eulogy to Spock from "Wrath of Kahn". (Dr. Carolyn Porco) I can only say this: of all the souls I have encountered in my travels, hers is the most... human. Thank you Carolyn for guiding us through the Cassini Odyssey and for the prose of your Captain's log. I can hear Carl Sagan mouthing those words. as "that golden machine, so dutiful and strong, ... enter('s) the realm of history, and the toils and triumphs of this long march (are) done." i want to extend the thanks i have already sent to that "golden machine" to the human members of the team that machine was a part of. your dedication and contributions are greatly appreciated, and should be appreciated for a long time to come. the amazing imagery and information you have brought to us are breathtaking and astounding. from the designers and assemblers, to the imaging team and scientists, to the radio-telescope operators who aimed their antennas to capture Cassini's voice, Thank You one and all. i am sad that this great mission has ended. i am also envious of those of you that participated directly with this mission. i have never had any opportunity to be a part of anything like it. not even close. i can't think of a better way to spend 27 years of working life. Saturn and Titan Cameo Appearance in STAR TREK! Subscribe to CICLOPS RSS feed.